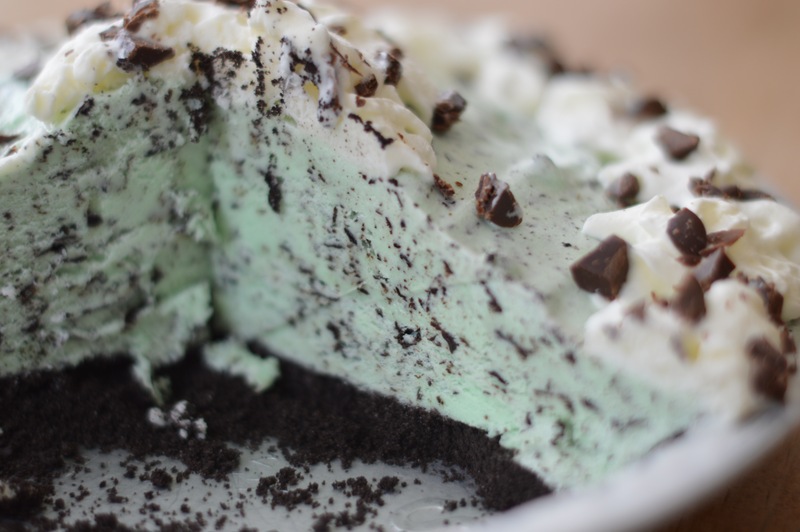 Sure – red, white and blue flag cakes are really cute and patriotic, but there’s an easier summer dessert that will get just as many ooohs and ahhhs from the crowd: No-Bake Grasshopper Pie. In summer, sometimes simple is best. 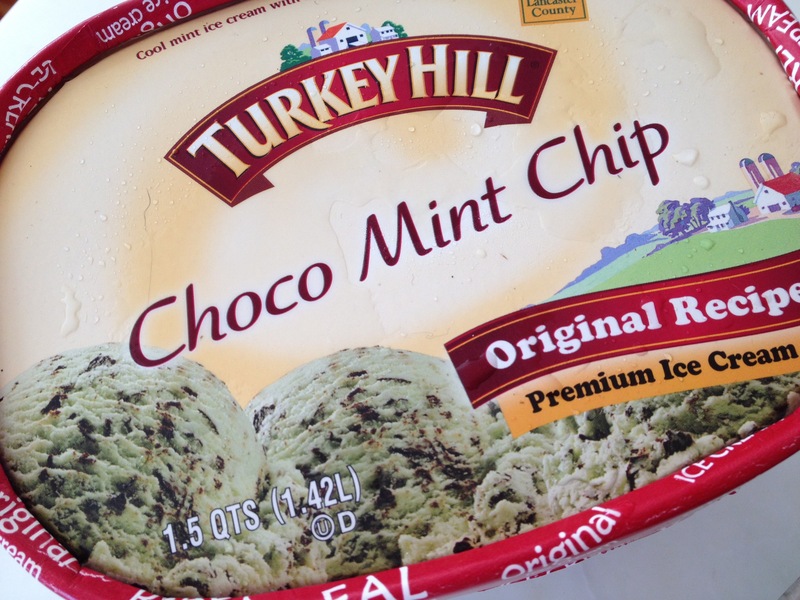 Especially if simple involves mint chocolate chip ice cream. And Oreos. 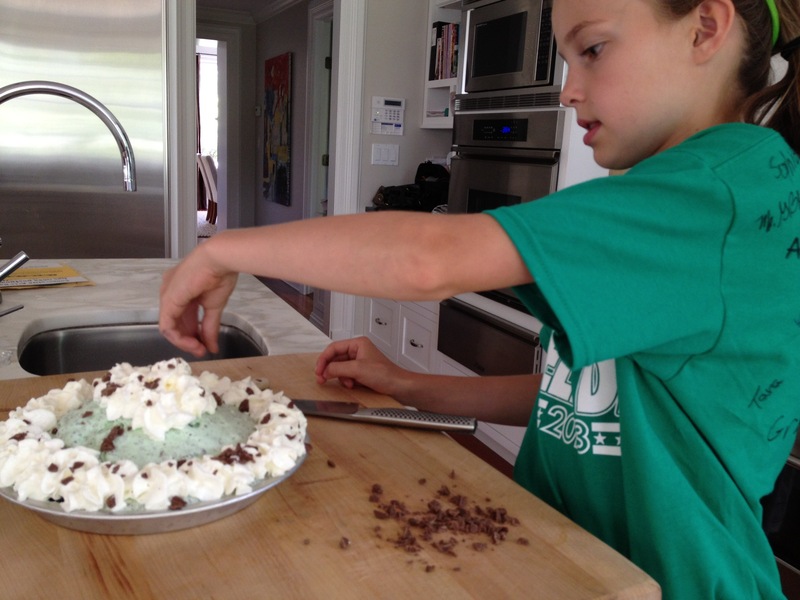 Fill the pie shell with the softened ice cream, mounding it in the center and spreading with a spoon or spatula to create a smooth dome. 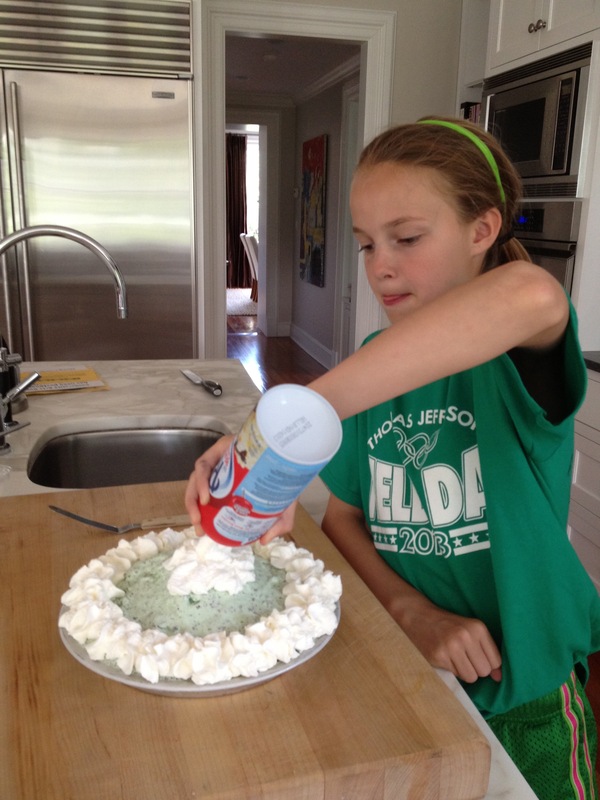 Place pie in freezer for at least 30 minutes before decorating with whipped cream. Not perfect? Not a problem! Whipped cream will cover all flaws. 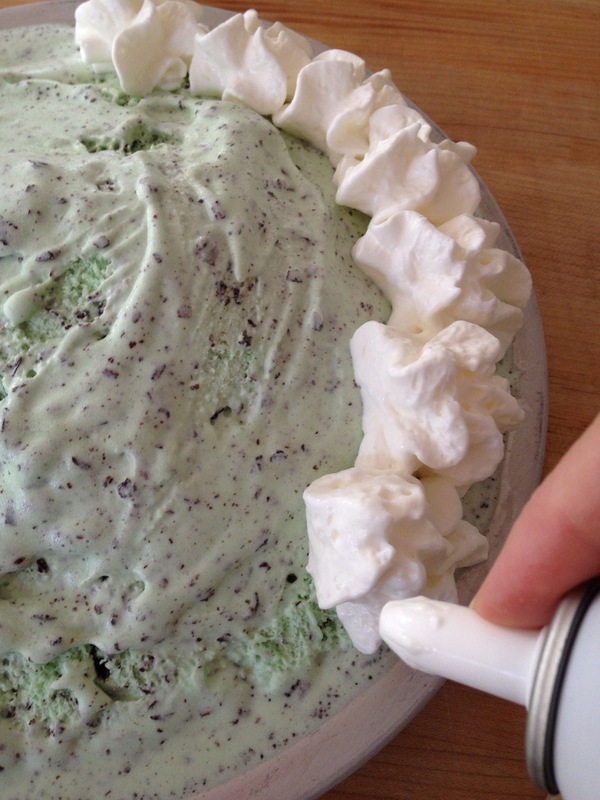 Decorate edges and top of pie with whipped cream rosettes. 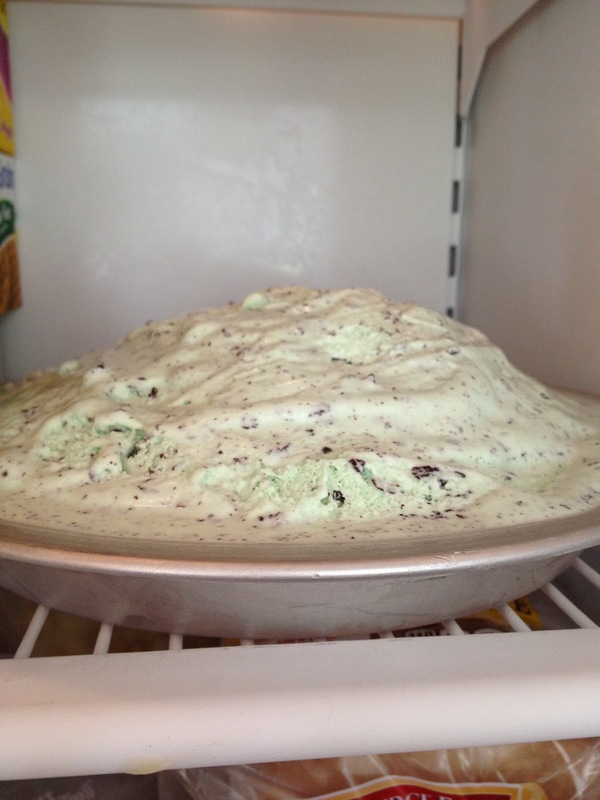 Return to freezer for at least another 30 minutes or until ice cream is firm. Just before serving, heat fudge sauce in the microwave (right in the jar, minus the lid). 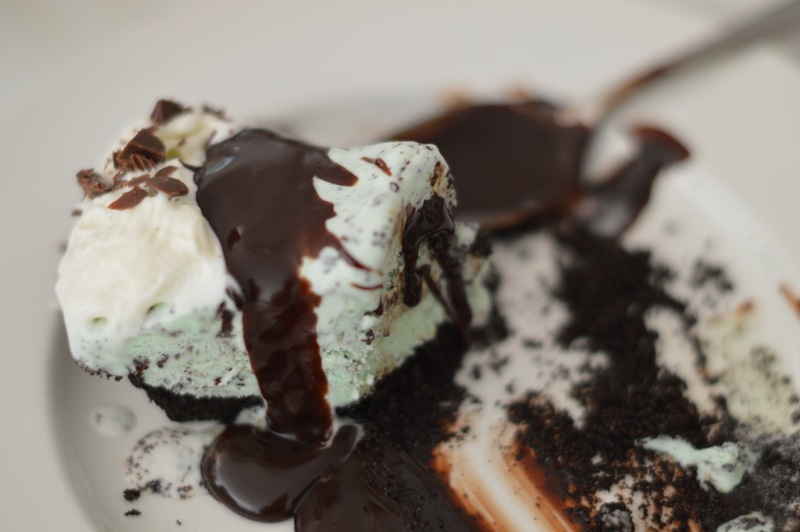 Spoon hot fudge sauce onto plates and/or drizzle over pie slices. 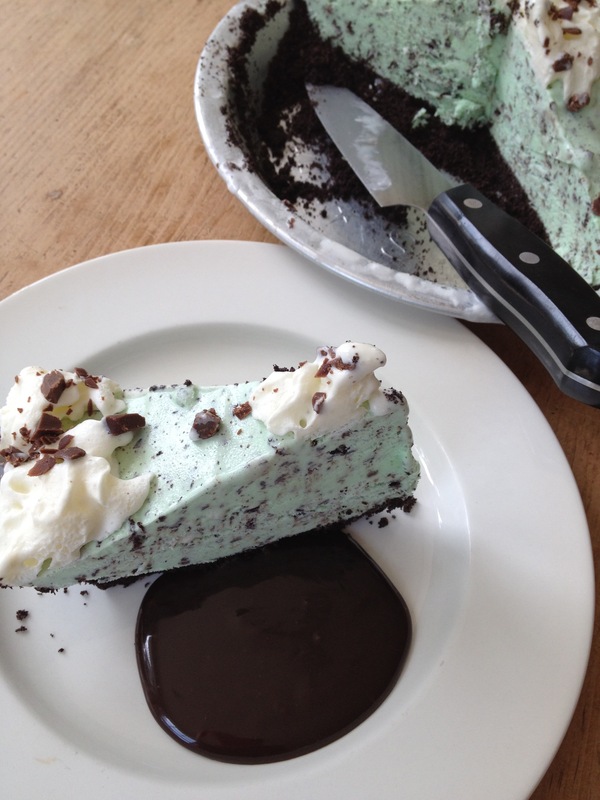 Cover any remaining pie with plastic wrap. Could keep for several days in the freezer, but this is not likely. 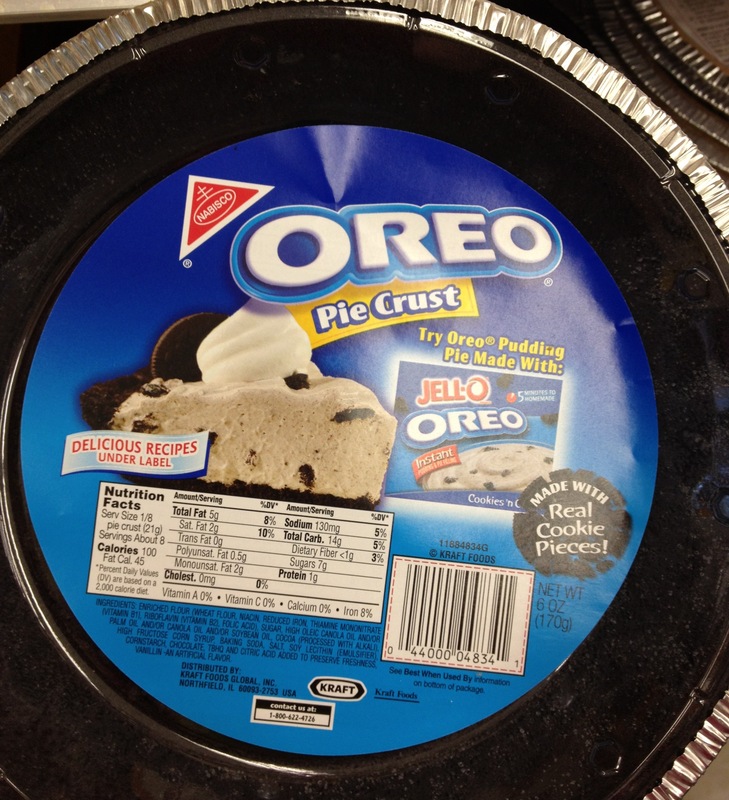 * If you can’t find an Oreo pie shell, you could make your own. 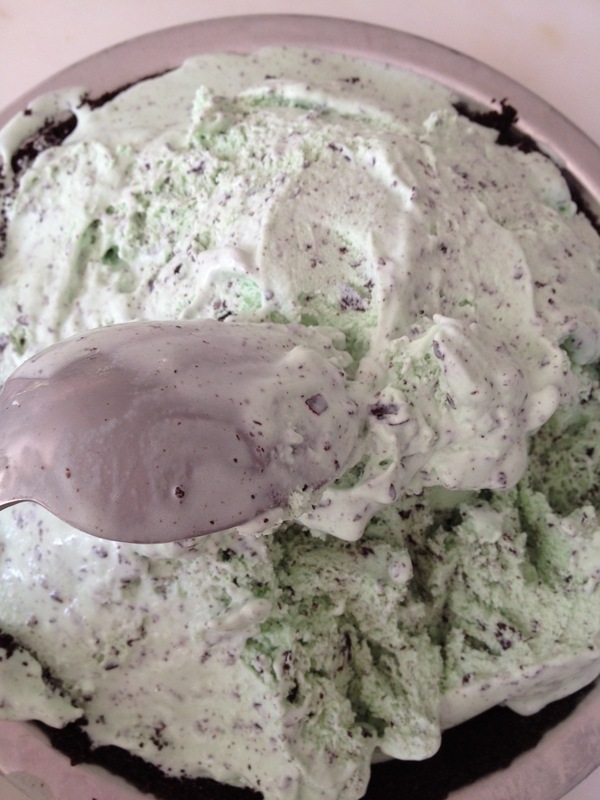 Place 3 rows of regular Oreo cookies into the bowl of a food processor. Pulse until you have fine crumbs. 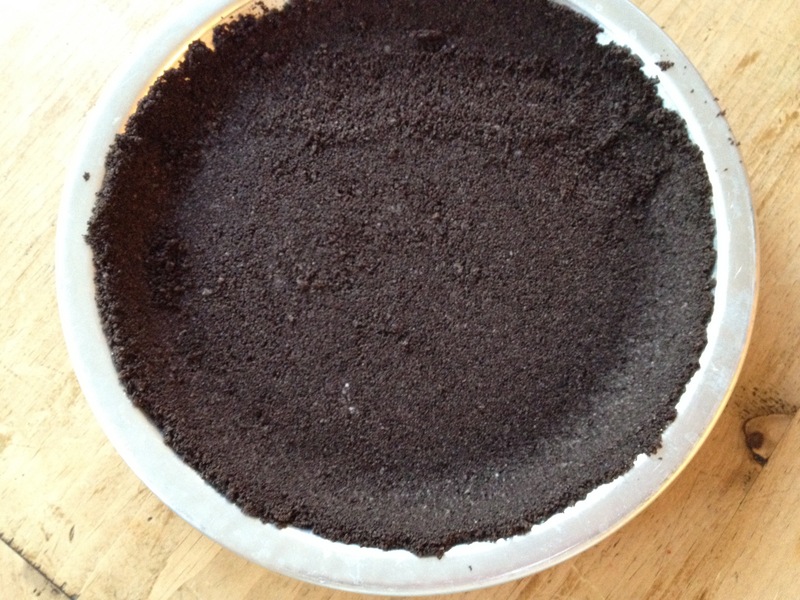 Melt 1/2 stick of butter in a microwave and pour over Oreo crumbs; pulse to form wet Oreo “sand”. Transfer crumb mixture to a 9” pie plate and press to form crust. Freeze until solid before proceeding with recipe. 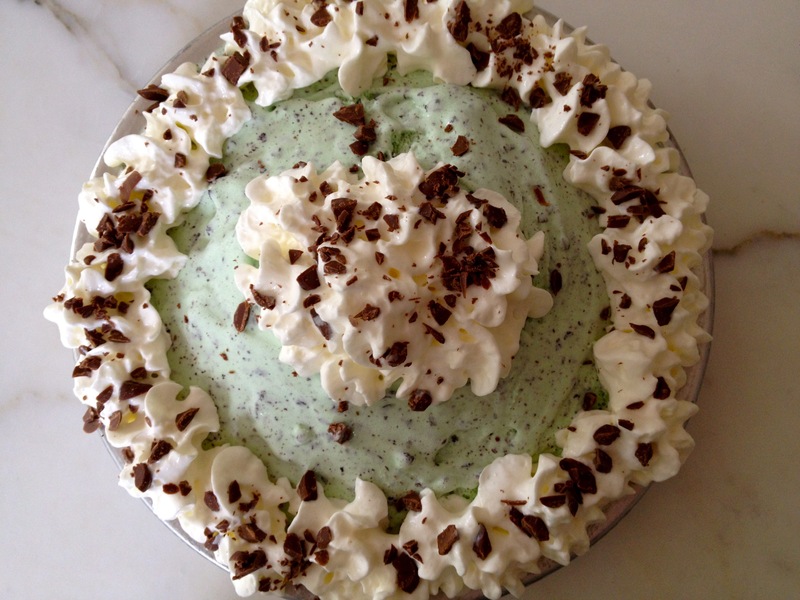 This entry was posted in Desserts, Kids & Family and tagged Desserts, Grasshopper Pie, kids' desserts, no-bake desserts, Oreo pie, summer desserts by subeeskitchen. Bookmark the permalink.